Katie and I just got back from a two-week vacation in the south-east United States for a double-family vacation. We started off our trip in New Orleans, LA to meet up with Katie’s family for the Labour Day long weekend and to celebrate Katie’s birthday. Then we made our way to Charleston, SC to see some of my family, where my parents made a last-minute decision to fly down to join us at my aunt’s beach house on Sullivan’s Island. While we were there, we made a trip in to Columbia, SC to see more of my family for a big dinner out (17 people, including lots of kids), and also drove down to historic and beautiful Savannah, GA. It was definitely a packed couple of weeks, but we saw lots, and took lots of time to ourselves, and made sure to swim in the ocean almost every day. It was very hot, and extremely humid for us west coasters, and the locals were definitely complaining about the heat, even though we were in the middle of a ‘cool streak’. I shot a ton of photos, so it’ll take me a while to go through them, but I thought I’d start off with a quick blast of pictures from the iPhone while we were in New Orleans. It just happened to be the South Decadence weekend, which is the gay pride festival of the south. It was definitely crazy down there… Almost indescribable at times, but let’s just say it makes all other North American gay pride festivals look pretty tame. It would be a close runner-up to Mardi Gras as far as Bourbon Street’s wild party atmosphere that it’s known for, and it was pretty awesome seeing the handful of religious protesters holding their oversized placards and screaming into their megaphones while the 4000+ revellers went about their business pretty much ignored them. There was also quite a bit of action on Decatur Street in front of Jackson Square where the NFL was setting up for the big kick-off party taking place a couple of days later. There’s no shortage of reminders down there that the New Orleans Saints won the Super Bowl last year. 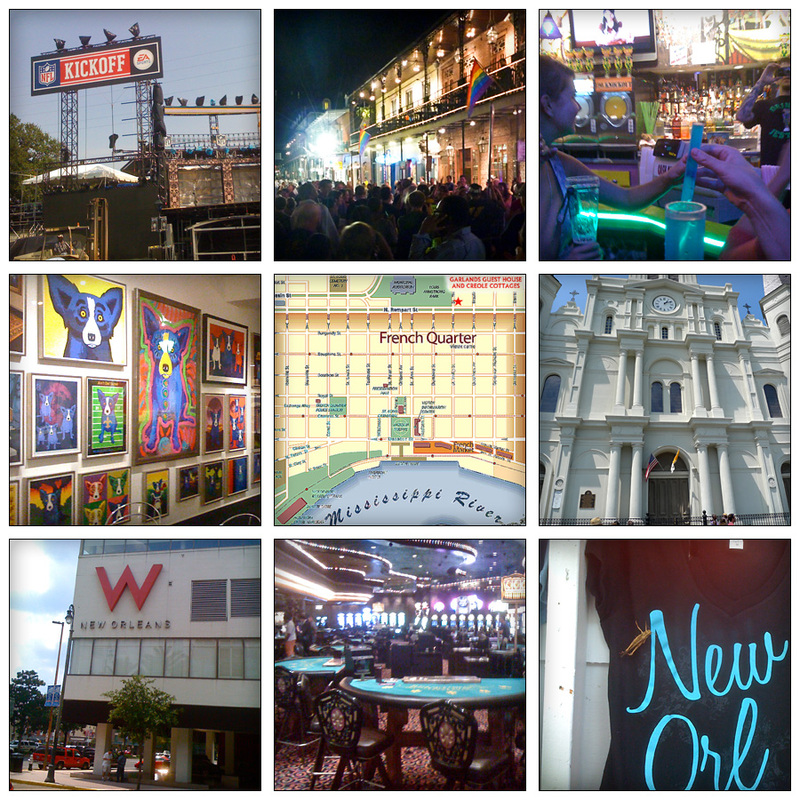 Some of the pictures above – celebrating Katie’s birthday in New Orleans, there was a round of shots with the whole family at midnight. We found a grasshopper beating the heat at one of the souvenir stores, chillin’ on one of the t-shirts, and I don’t know what’s up with all those blue dog paintings, but not only was one shop full of them, you’d see that dog everywhere. I’ll have to look that up sometime.